If you're charging $30 for a registry cleaner, it had better be pretty darn good. Dubai Click's utility PC Fix Cleaner is. Whether that's enough to recommend it over an effective freebie such as CCleaner is another matter. PC Fix's interface is handsome and clean, with options tucked away neatly. Being a simple program with one purpose, PC Fix Cleaner 2.06 is easy to use. Scan the registry, view the results, and have it apply the fixes. The free demo fixes only minor registry problems, but shows you the others the program can fix. The full version found and fixed a whopping number of issues on my test bed that I use for testing software, all of them seemingly legitimate. The program also offers registry backup and the means to remove startup items à la Windows own msconfig.exe. PC Fix Cleaner defaults to starting itself every time you boot Windows. If you want to waste every second this program might save you and more, leave it that way. A better plan: Just run it as needed. Also, the website popped up one of those annoying "Are you sure you want to leave?" dialogs. Don't surf to the PC Fix Cleaner site if you have an aversion to such. 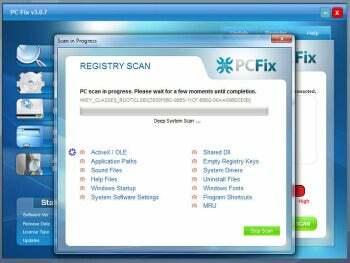 PC Fix Cleaner is easily one of the more effective registry cleaners I've used. But the price, defaulting to autorun, and annoying Web site are all significant negatives. Though a very good registry cleaner, PC Fix Cleaner is pricey for the actual good it will do your system.